Funkadelic :: Can You Get to That? My face is sunburned from drinking tequila in Mexico this past weekend during the wife’s b-day. Thankfully we had this album with us. 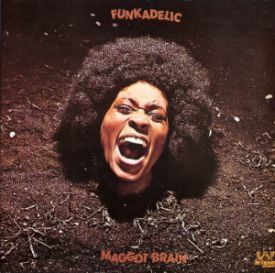 I recently replaced my old copy of Maggot Brain with the 2005 reissue that cleaned up the sound (considerably) and tacked on a couple of bonus tracks. It goes without saying that I’m having a damn good time getting to know this joint again after many years away. The history and lineage of George Clinton’s various groups and offshoots is as confusing as it is creative, so for those not obsessed with all-things-Clintonian, it is important to know that originally Funkadelic was quite different from Clinton’s adventures with Parliament. This would go on to change as Clinton tied the sounds and bands together under the loose P-Funk moniker due to ego clashes, legal battles, and general mayhem. But all this did not happen for some time, and on Maggot Brain, the group’s second album there was a clear distinction. The album (rightfully so) gets huge props for the guitar courtesy of Eddie Hazel — who was at the time (1972) was considered to be the ‘new’ Hendrix. But let’s take alook at “Can You Get To That,” the albums second track, a straight forward, funky, R& B jam that helped make this LP the eclectic watershed that it has become over the years. Also: The video below of Funkadelic is from 1969 television show asking the age old question: What is soul? The track, taken from their self-titled debut LP, offers up the following: What is soul? I don’t Know. What is soul? Soul is the ring around your bathtub — What is soul? Soul is a hamhock in your cornflakes. If you haven’t heard this tune, SWOOP IT NOW. Blows my mind everytime I hear it. Brilliant record. “Hit It and Quit It” is equally as funky and keeps the perma-grin stretched. Wife, Tequila, Mexico and Maggot Brain…sounds like a great weekend. Timely. Check out ‘we’re gonna be timeless’ tonite from 6-8 PST on little radio for a 2 hour funkadelic tribute. http://www.littleradio.com. Does that reissue include the group photo that was inside the original gatefold? maybe the best, definetely the most badass group photo in rock music ever. bandy – yeah the booklet is pretty nice, with old pics and background.